I’ll be short and to the point. Recently I have been introduced to the Enneagram. For those of you who use Meyer-Briggs: this is a personality test and tool that is much more complex and has much more to offer. I had a very interesting conversation with Roxanne Howe-Murphy last week. She is author of Deep Coaching – Using the Enneagram as a catalyst for profound change, teacher and coach at www.DeepCoaching.com. Right now she is participating in a book competition The Next Top Spiritual Author, for her next Enneagram book “Deep Living”. Please vote here: http://bit.ly/NextTopAuthor I will tell you why. There is a gift and a danger with personality type tests. You can limit yourself by identifying yourself with the type. Roxanne specializes in working with the Enneagram as a recipe for liberating individuals from the type. 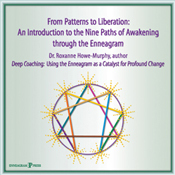 With other words, using the Enneagram stimulating real transformation by unhooking individuals from beliefs, behaviours and thoughts that are no longer useful. I told her a little bit about the Jante Law and limitations existing in the Scandinavian culture. “Oh, it’s interesting – you could actually use the Enneagram on a National level”. Are you serious? Wouldn’t that be hilarious – “Enneagram – A recipe for Liberation of all Scandinavians from the Jante Law” – would you co-write that book with me? “Yes, sure” she said. Now – are you curious how that would look like? Unless you vote now for her next Enneagram book “Deep Living” you will never find out… http://bit.ly/NextTopAuthor Do it now, share it with everyone you know, and help her spread the word and knowledge of profound change. Absolutely do it before May 3rd. It’s a quick action. Thank you for doing it. Enneagram – now I am very curious… This is wikked.